Valentine’s Day just passed! Lovers- did you have a romantic day? Maybe you even got engaged, it’s a big day for marriage proposals! TRF loves weddings. We really do. 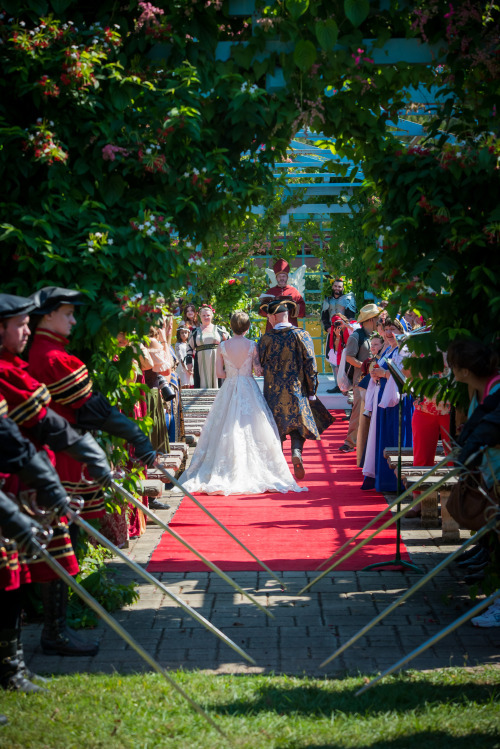 We hosted a record breaking 57 nuptials in 2015! I remember in my first year as a performer that I would tear up every time a bride rolled by on the carriage. We would, and still do, shout “Joy to the bride!” as she passed, and my heart would go all mushy. Not only do we love weddings, but we do them well. Our wedding coordinator has put together a team of professionals that make the wedding day completely special for each and every couple. Our venues are beautiful and unlike any you’ll find, with our vine covered chapel and rose filled gardens. In fact, we were voted Couples’ Favorite by Weddings in Houston. Why did you choose to have your wedding at the Festival? Did you and Kaellub have any special memories associated with the Festival? We knew from the get-go that we didn’t want a traditional wedding and desired a celebration that friends and family would actually have fun going to instead of attending through mere obligation. Typical and over-done beach weddings or boring church ceremonies just don’t fit either of our imaginative and unique personalities at all! Before I had even met him, I remember being at the festival with my best friend (we used to go every year together) and constantly saying how cool I thought it would be to get married there. 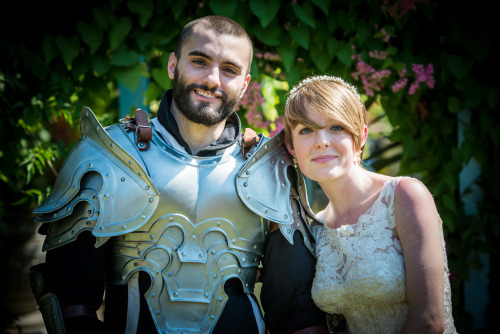 Fast forward a couple of years and getting together with Kaellub – we found ourselves discussing the exciting possibility of getting married together and I suddenly had one of those “AHA” moments and remembered the Renaissance Festival. I don’t think we even searched for or gave any other kinds of venues a chance in the matter. We knew right away it would be perfect for us. 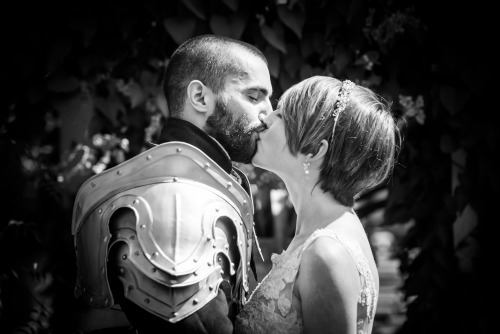 Ultimately, it was special because we got to get married in a different time era and it fulfilled our familiar and comfortable realm of fantasy we often shared since we play a lot of video games together. Oh I don’t even have to think about the answer to this one. So after I had gotten all ready with my maid of honor, and my heart is literally beating out of my chest and I’m fidgeting furiously with my bouquet of flowers, I remember hearing that long awaited door knock. “Are you ready?” So out I went, gripping my flowers as tightly as I could, imagining the horrible possibility of tripping over my dress or just anything bad that could possibly happen. We enter the lively and crowded scene of the festival grounds and the guards who were escorting me to the carriage help me up. As I sit down with my maid of honor, my nerves begin to get worse and I squeeze the life out of her hand until the carriage starts to move. The guards escorting the carriage proudly marched and periodically announced “MAKE WAY FOR THE BRIDE!” and I remember waving and seeing what seemed like thousands of people staring and smiling at me. It was in this moment that it hit me. An intense wave of tears attempted to break through my eyes and I bit my lip to prevent them from doing so; and it wasn’t the fact that I was living out the “knight and princess live happily ever after” but just… feeling all of the sheer happiness of everything that has led up to this point together attacking me at once. I knew my eyes were watery through the whole way, but that moment is something I will never forget. I was really good friends with his cousin, and I would often play online multiplayer video-games with him and Kaellub. We all chatted occasionally on Skype when we would all play, and although I we shared a really common sense of humor and laughed a lot, I actually didn’t get to meet him in-person until the holidays of that year came around. Up until that point, I was actually sort of intimated by him and didn’t even know what he looked like. So when the holidays came around, his cousin offered me to join him and his family since my family doesn’t really do much of anything during the holiday seasons. As nervous as I was about it, I decided to go and of course ended up meeting Kaellub in person during the visit. Not to sound cheesy or anything, but it was literally crush-at-first-sight. This didn’t help my already nervous situation, as once I realized how attractive he was, I felt even more intimidated and decided he was way out of my league anyway. As time passed on, his cousin eventually left the usual gaming scene and ended up just being us two playing together. Eventually that became the recipe for getting to know one another very well, and I began making 4 hour drives every weekend to come and visit him. Everything just got better and better from then on out as you might imagine! At the time, we were working on a creative project together and I was the one working on the visual aspects of it while he did the writing. We both had the day off and we were working on this project via our computers for several hours. Little did I know, he was actually writing a recall of all our memories together as a couple. He left the room and allowed me to read it, and as I did I began crying. Funny enough, I still wasn’t expecting what was unfolding until the question was popped in the last sentence: “Will you marry me?”. I did the classic hand-over-my-mouth gesture and turned around to go find him and there he was! I think were both total babies – sobbed and held each other for at least an hour before we were composed enough to call our parents to tell them the good news! Haha! 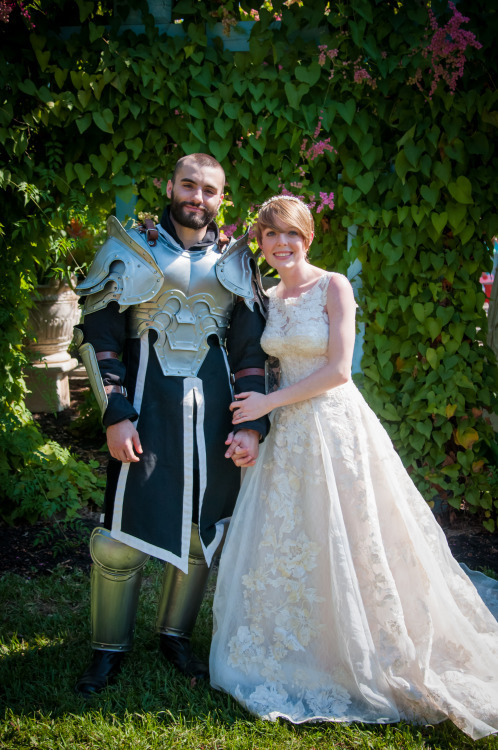 What was your favorite thing about your Festival wedding (this can be one specifically about something related to faire itself). Definitely the ceremony venue we chose. How can you go wrong with an overgrown canopy of ivy, statues, and stones? Or walking down the aisle with an arch of swords above your head with bagpipes and beautiful music playing? You can’t. Did I mention bagpipes? We both agree that just the festival’s atmosphere and mood in general was wonderful and definitely became the cherry-on-top in the end. You really do feel like you’re in a different time and everyone is kind of role-playing their own character. All of our family members and friends dressed up in costumes, including the ones we never thought in a million years actually would. Quite a bit! Right now we are in the stressful and exciting process of being pre-approved for a house as first-time home buyers! Kaellub is in the hopeful preparation of joining the Fort Worth Police Academy and I am within two years of receiving my bachelor’s degree and am also working as a concept artist for an indie game studio. What advice would you give to this year’s brides- how to make the most out of your faire wedding? If you and your honey are interested in a wedding at TRF, sign up for one of our wedding tours! You’ll have a chance to see all the venues and packages, as well as ask any questions you may have. Dates are May 14th, June 11th, July 30th, & Aug. 27th (please call or email to make a reservation).Watch our Facebook page for information on our wedding giveaway announcement coming soon.